HOLLYWOOD – On the day when the giant shark was scheduled to have its first trial run for "Jaws," director Steven Spielberg arrived early at the location on Martha's Vineyard. But not early enough. There were already 200 pleasure boats in the area, captained by shark fans. While Richard Zanuck, the co-producer, raced around recklessly in a speedboat trying to drive the would-be sightseers out of sight, Spielberg felt a knot growing in his stomach. That morning had a lot to do with the obsessive secrecy surrounding Spielberg's new film, the $14 million “Close Encounters of the Third Kind,” a movie about humans and beings from outer space. Many millions of those dollars were spent inside a vast airplane hangar outside Mobile, Alabama. The hangar is four times as large as the largest sound stage ever used for a film. What went into it? Columbia Pictures is only too happy to tell us. Tons of construction steel went into it. And untold thousands of square yards of plastic sheeting. Enough concrete to build a highway from Mobile to the next town down the road. Acres of canvas. A fortune in special effects. Devices requiring enough electricity to light a city. And what was built with all that stuff? During these 43 minutes, I asked, would it be safe to assume that the characters in your movie meet aliens and have some sort of confrontation with them? In his office at Northwestern University's observatory in Evanston, Dr. J. Allen Hynek remembers the first time he heard about Spielberg's movie. “It was an article in Time or Newsweek, one of those, about how successful ‘Jaws’ was. 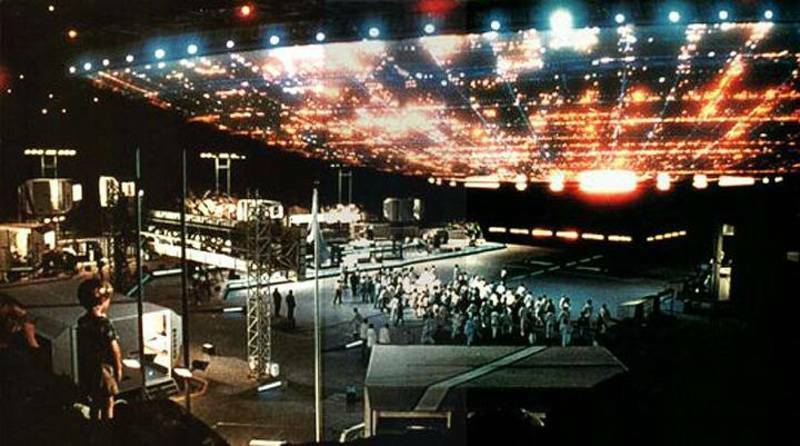 And then it mentioned that Spielberg's next film was going to be called ‘Close Encounters of the Third Kind.’ Very interesting, I thought, because it so happened that I had coined that title in my book, "The UFO Experience." Would it be safe to assume, I asked Hynek, that in the movie humans have some sort of confrontation with aliens? Hynek dropped Spielberg a note pointing out that the movie's title came from his book. “That's right,” Spielberg replied. “I got it out of your book. It fairly leaped off the page at me as a movie title.” He invited Hynek, the nation's best-known UFO researcher, to become the technical advisor on the film. And he loosely based the film's central incidents on various encounters described in Hynek's book. One of them took place in Atwater, Ohio, where several policemen engaged in a hair-raising 100 M.P.H. chase with an Unidentified Flying Object. Although they were all presumably reliable witnesses, the Air Force rejected the story and the policemen got the curious notion that people were laughing at them behind their backs. “It's always the same story,” Spielberg said. “Typically, you get a reliable witness. A judge. An attorney. A police officer. But people won't believe them. The movie takes place in Indiana, and one of the sightings is by a guy who works for the local department of water and power. He's played by Richard Dreyfuss, who was the shark expert in ‘Jaws.’ This is his first role where he plays an average guy - he's always playing people with super IQs, or we're watching Sammy run. “In my 25 years of work in this field,” Hynek said, “I've heard the same two statements over and over. First, they say they've never seen anything like this before in their lives. Then, they say if they ever see anything like it again, they're not going to say anything about it to anybody. “People get ridiculed, laughed at… it's a scientific research problem. You can't get anyplace unless you have good data, and you, can't get good data if people won't report. And people won't report if they're going to have to go around being asked how many little green men they've seen this week." Little green men. There have been lots of aliens in movies over the years, mostly in the Bug-Eyed Monster category. There have been spiders from outer space, and lizards, and robots, and mostly they looked ridiculous. In the most ambitious science-fiction film ever made, Stanley Kubrick's ‘2001: A Space Odyssey.’ the problem of presenting aliens never was overcome. As Arthur C. Clarke, author of the screenplay, tells it in his book, "Lost Worlds of 2001," he and Kubrick spent months trying to visualize a practical, working alien, as it were. They had one model with a handy multipurpose, centrally located orifice that served all the functions of breathing, eating, elimination and reproduction. Nice and practical, but would people, ah, laugh? Another model looked too Bug-Eyed Monsterish. Kubrick finally said the hell with it and suggested an alien intelligence in the final scenes of his movie instead of actually showing an alien. What about “Close Encounters”? I asked. Are you going to show aliens, or merely suggest them, as Kubrick did? And if you show them, are we going to laugh, or will we accept them seriously? “In a great many close encounters of the third kind,” Dr. Hynek said, “the witnesses describe a being that seems remarkably similar from account to account. But please emphasize that I am acting now entirely as a reporter, telling you what other people have described. I myself have never seen a UFO phenomenon. And do the beings communicate with humans? Do they talk in the observer's native language? “This movie was actually started before ‘Jaws’” Spielberg said. “In fact, it sort of started a long time ago, when I was 17. I made an 8mm film that was 150 minutes long, called ‘Firelight.’ A real science fiction film, about flying saucers and so forth. It cost $500. I rented a theater for one night and made $600, so I was in the black. I've always been interested in UFOs. I wrote the screenplay and then ‘Jaws’ came along and I put it on the back burner for awhile because it was going to be awfully expensive, about twice what ‘2001’ cost. But, let me guess, I said, at this point you don't want to say exactly what he does, because that's what happens in the airplane hangar larger than four sound stages and filled with millions of dollars worth of concrete, plastic and electrical equipment. Right? “I'm really very sorry,” Spielberg said. “I can't tell you. But it's amazing. Were you inside that airplane hangar outside of Mobile, Dr. Hynek? Spielberg says we will be amazed. Will we?